Etymology is an important science that seems to have fallen out of vogue. The daily decimation of the English language has been made clear over the pass two decade with the advent/recognition of Ebonics and the Urban Dictionary - or maybe it is because Merriam Webster adds hundred of new words each year and changes the meanings of the others. Few realize that historically, languages dramatically change on their own about every 700 years and consequently, so to do countries and cultures (think Gaul/France, Angl-Saxon/Great Britain, etc). 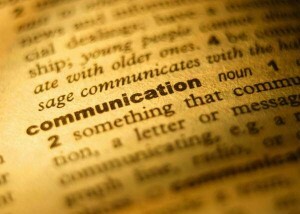 Language is arguably the principal tool of a unified society. The information age most likely will speed this natural process up. In some ways, it seems we have created our own Tower of Babel and splintered our own society in the process. The Church has always understood the power of language. The first nine centuries of the Church our liturgical language was Greek. Then with the spread of Christianity through Europe, Holy Mother Church needed to figure out a way to bring warring clans together as the idea of states and countries began to form. Her solution? Latin. Latin as a language was no longer being used as a common tongue. It’s vocabulary and meanings had been solidified and thus the “negotiation” of terms and finding a common lexicon in a conversation was eliminated. So, she introduced it to her liturgy. Quickly it also became the language of education and with it a golden age of scholasticism. As mentioned in a previous post, the term culture is derived from the Latin term cultus. Cultures are formed by what they worship. I say this as a prelude to understand a re-posting of an article on the term holy which the author briefly applies to sacred music. Music is a visceral topic to all, especially liturgical music. Any teacher will tell you that music is one of the single most effective teaching tools in their toolbox. Since the Second Vatican Council, the Roman Rite has experienced an explosion of creativity as it relates to liturgical music. Some good while others disastrous. I am a particular fan of Praise and Worship music. It has played a huge part in my life and historically has been part of our tradition since the beginning – but it does not constitute sacred music. Not because it does not raise our hearts and minds to the highest heavens but it is transitory in nature. That is easily illustrated by just the simple observation in changes of style every few years. Sacred Music, and yes, I mean Gregorian and Plainchant, have an enduring quality about them that is shaped by the use of Latin. The language and the way it is expressed shapes how we express ourselves in worship. I suspect that you would never find hands raised in praise during the O Salutaris. It seems out of place which does not mean that folded hands are more reverent than raised – just different expressions for different liturgical actions. I guess the last point is that our liturgy is supposed to be universal. For some reason we want to customize it and make it attractive so that more people will like it. Isn’t that called entertainment? The Sacred Liturgy is just that, sacred. The problem is not the music (although it helps) nor the preaching (Lord does this help). The problem is liturgical illiteracy and a common language. The problem and solution is us. Maybe we should discuss this further because as I mentioned before, music and Latin in the liturgy are very visceral topics. Music is probably the easiest and most logical first step in re-educating our family. Thus, I expect to see (and in a sense hear) your comments. I want to thank Jake Tawney at the Rome locuta est blog for the following article that he posted on August 26, 2010. One of the many problems in dealing with theological questions is the issue of vocabulary. This often come up when Catholics are discussing the issues of salvation, sanctification, redemption, and justification with Protestants. My experience is that people are knee deep in arguments before they realize that either (a) both sides intend something entirely different when using any one of these terms, or worse (b) one or the other is unaware themselves of what they mean when they use the vocabulary. Undefined terms are not limited to debates between Catholics and Protestants. They can occur even among Catholics, as is the case in terms such as pastoral, tolerance, or even truth (Quod est veritas?). In discussing the nature of sacred music and architecture with people who have difficulty in either understanding or accepting the Church’s tradition, one source of the problem is the lack of an adequate understanding of the word sacred. Worse yet is the ambiguity imbedded int he use of the word holy. In this post I seek to recover the meaning of the terms, to explore some related words, and then to briefly comment on how this impacts the manner in which we understand the Church when she speaks of “sacred music”. There are three related Latin words that are worth mentioning. The first is sacerdotalis, an adjective meaning “priestly” and deriving from sacerdos (“priest”). This word shows up in the first line and title of Pope John Paul II’s Ordinatio Sacerdotalis (“Priestly Ordination”). The etymological connection between the sense of priest and that of sacred is obvious, which in part explains the Church’s phrase “Holy Orders” in reference to the Sacrament that confers the priesthood upon men. The second related word is sacrosanctus, which is an obvious combination of sacro and sanctus. It’s translation is the same (“consecrated”, “made holy”) but has an even stronger emphasis on the religious nature of the “setting aside”. The English word “sacrosanct” (meaning “extremely sacred or inviolable”) is a derivative. We see this word show up in the Vatican II Constitution on the Liturgy: Sacrosanctum Concilium (“This Sacred Council”). Finally, we have the common Latin word sanctus, a masculine perfect passive participle of sancire, translated “having been made holy.” The word can also be a noun meaning “saint” or “one who has been made holy.” This is the word that is used to refer to a canonized Saint in the Church, and its identification with the perfect passive participle is important in that it emphasizes that the sanctifying action is on the part of God, not on the part that was “made holy”. There is a plethora of English derivatives for these various forms. To mention just two, “sanctify” means to make holy, and “sacrifice” means to side aside for God (which emphasizes Ratzinger’s point that it is not that nature of sacrifice that necessitates the involvement of destruction, but rather it was the advent of sin that gave rise to the bloody sacrifice on the cross). From where, then, does the word “holy” come, which sounds nothing like any of the Latin words? The answer is not to be found in the Latin language, but in Old English. The original word is halig and translates the same (“holy”, “sacred”, etc.) It use is a bit wider, however, as it can mean “healthy” or “pius” or even more generally “one”. There is an obvious metaphysical point here: that which is set aside for God (“made holy”) is also properly integrated (“one” or “whole”); the final cause (telos) of all creation is identical to its efficient cause (that from which it came), namely God. It is from this Old English word that we get the term “hallowed”. The lesson here is that the term “sacred” or “holy” (or any derivation of this) always has an element of being “set aside” or “consecrated”. This helps us to understand why the Church is in need of a style of music and art that is not that of pop-culture. Liturgical music, precisely as liturgical, is in need of an artistic style that is truly its own. Only then can it be said to be “set aside”. 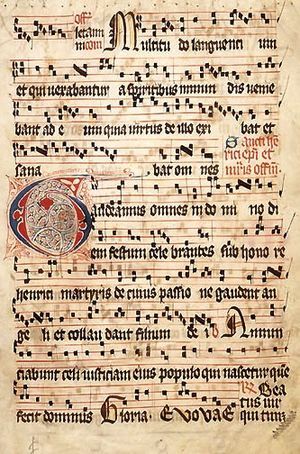 When we say that Gregorian Chant and Sacred Polyphony are examples of “Sacred Music” we mean that they have been set aside for specific liturgical use and that they differ from music that is “secular” in style. “Secular” comes form the Latin saeculorum, meaning “of the age”. Think here of the end of the Gloria Patri: et in saecula saeculorum, meaning literally “and in ages of ages”. The translation “forever” is appropriate but loses the poetic repetition. Another antonym of sacred is “profane”, from the Latin profanus meaning “not religious”. When we understand that being “set aside” is a critical element of being holy we can better understand the Church’s claim that some music may be religious without being sacred. 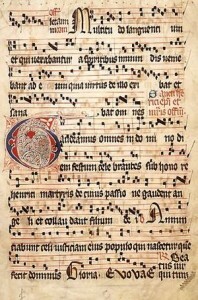 Certainly Gregorian Chant and Sacred Polyphony are both religious and sacred. The question is: can praise and worship music, which by its nature models the music of our age, and thus rendering it secular, honestly be described as “sacred”? The same question applies to the vast majority of music composed in the last several decades, the only difference being that the “age” is one that is fossilized in the 60’s and 70’s rather than the current age. Before closing let me make a few comments about the Latin language in general and its suitability for the Liturgy. First, the vernacular (from the Latin vernaculus meaning “domestic” or “indigenous”) by its nature is also secular (“of the current age”). Latin, however, is a language set aside for a sacred use. Even in periods where Latin was the vernacular, the form of the vernacular and the form of that used in the Liturgy were different enough that people like Ratzinger argue that the average Catholic would not have been capable of fully understanding the language used in the Mass. Hence, even when Latin was the language of the day, the form used in the high church liturgies was a form “set aside” for liturgical purposes. Many religions have seen the importance of having a language set aside for sacred use, be it Hebrew, Greek, or in this case, Latin. * This is not a wholesale criticism of the new translation – it is certainly a dramatic improvement over the one currently in use, and I will welcome it with and open heart and soul on the First Sunday of Advent 2011. I am always dumbfounded as to how Latin was stricken from the normative use in the Liturgy. The depth that can be conveyed, within both the Latin and the Greek (as well as Hebrew and other more ancient languages), is mind-blowing. The inability of the English language to express anything other than what the speaker wishes to inflict upon you by inflection or by means of an inflammatory nature, seems to tell me that the English language is deficient, in almost every way, the theological realities (both physical and metaphsyical) that are represented within Liturgical Rites. We truly are lesser people for having had this done to us. Agreed. I do not know if I am ready to go 100 percent back to the Latin although I believe that I am coming to a point that I would rather relearn Latin than have to deal with the craziness of the translations and the music. I think that an incremental transitional explanation and education would be in order. I have also encountered a number of people who want to educate by singing the Latin and the English to demonstrate the beauty. My challenge is that a person is always, always going to choose what is more comfortable with them. The beauty is not the just the words but the words intoned in a very specific manner that accentuates the solemnity of the occasion. Sing the Latin, print the English for further study and reflection. Anyone who has taken a foreign language knows that full immersion is the onyl way to fly. Share book reviews and ratings with Deacon Marques, and even join a book club on Goodreads.